Novak Djokovic and Richard Gasquet will play first Wimbledon appearance in this Friday, at 10th July 2015 and match will be on court at 3:00 PM BST and 9:00 GMT. 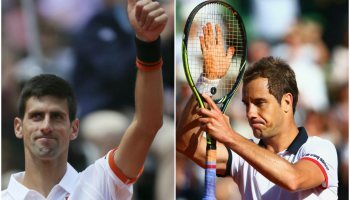 This Wimbledon Grand Slam 2015 semifinal match in between Novak Djokovic Vs Richard Gasquet will be their 3rd grand slam meetings and 14th all over. Novak Djokovic Vs Richard Gasquet meet 13 time before this match. Last meeting was in this year France Open grand Slam’s round 16 matches, which was their 2nd France open as well as 2nd major on court. All of this 13th head to head 21st choose of the tournament have won just 1 games vs. Djokovic and the match was in 2007 at Tennis Masters Cup’s RRA rounds. The defeats was for Djokovic by 6-4, 6-2. After that all 10 matches won by the world no.1 Djokovic. However, in between France Gasquet vs. Serbian Djokovicmeet in this first head games at Cherbourg Challenger 2005at round 16. World no.1 and no. choose Novak Djokovic just loos 2 sets in this current Wimbledon and both have come on the round 16 match vs. Kevin Anderson, Djokovic hardly won that match by 6-7(6) 6-7(6) 6-1 6-4 7-5. His last victories was vs. Marin Cilic by 6-4 6-4 6-4 in quarterfinals. That was his 5th consecutive wins after defeated Stan Wawrinka at the finals of France Open. 29 years of age Gasquetsi going to play his second semifinals in his career, where he was played his first Wimbledon semifinals at 2007. And overall it is his 3rd semifinal and first after 2013. So far have 12 career title without any major title. After turning into pro career won 401 games and lost 235 matches.